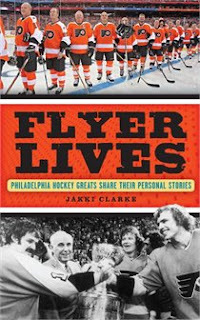 Jakki Clarke, the daughter of the Flyers legend Bobby Clarke, is coming out with Flyer Lives: Philadelphia Hockey Greats Share Their Personal Stories . Stretching back to the team’s birth in the National Hockey League expansion of 1967, this record follows the Philadelphia Flyers’ story, starting with the rabid fan base they built during their “Broad Street Bullies” era of the 1970s. The hard-charging Bullies’ back-to-back Stanley Cup victories in 1974 and 1975 are documented, and the team’s status as a perennial contender is illustrated through their 34 playoff appearances. Penned by charismatic superstar and team manager Bobby Clarke’s own daughter Jakki, this account reflects the personal relationships the author established with many of the team’s best skaters. Drawn from up-close interviews with more than 30 of the Flyers’ greats regarding their lives, playing careers, challenges, and successes, this compilation is a must-have keepsake that all Philadelphia hockey fans are sure to cherish. Players from all eras are represented—including Billy Barber, Bernie Parent, Mark Howe, Keith Primeau, and more—sharing never-before-told stories about learning to skate, playing pranks in the locker room, enjoying the fruits of victory, and overcoming crushing defeat. Containing valuable advice for both athletes and parents, this is an intimate look at a group of men who have experienced the ups and downs of a demanding sport at all levels.